For years there have been promises that new technology was poised to automate everything and make our lives easier. Myths were told that software would become smarter, that computers would create more efficient systems saving businesses time and money, but so far there's been little evidence of this labor saving revolution. The photography industry went through tremendous technological upheaval in the early 2000's as DSLR cameras fell in price while hardware specs grew more robust. Portrait photographers adapted quickly to this new technology, creating a digital imaging workflow that often required retouching thousands of images per day. Software companies responded during the rapidly evolving film-to-digital transition, but as these companies matured, innovation slowed to a crawl. In fact, most digital imaging workflow software looks almost exactly the same as it did when it came out. Yet technology outside the photo industry has continued to change at an astronomical pace. 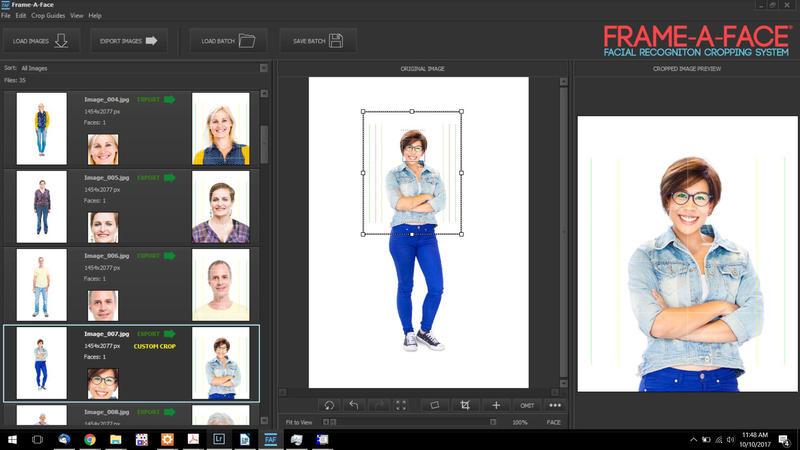 The development team behind Frame a Face set out to leverage these new technologies, building a suite of "smart" applications designed specifically for the digital imaging workflow. Their first application, Frame a Face, applies a facial recognition library to a folder full of images. The photographer sets the master crop, then Frame a Face applies the same crop to all images in the batch by finding the face of the subject regardless of where the subject is located in the frame. The images can then be exported in many formats--head and shoulders for yearbook photos; a loose, 5x7 crop from printing; and a tight to head crop for ID badges. The master crop set-up and export process takes just minutes. This is an ingenious method to cropping images, saving school, sports and other portrait photographers literally hundreds of labor hours. As soon as they processed their first batch, customers began to sing the praises of Frame A Face. The following quote is from the very first customer, a high-volume school and event photographer from Texas. He realized how to leverage the power of Frame A Face immediately: "Now I can just shoot wide, and I don't really have to even mess with raising and lowering the camera nearly as much. It greatly speeds up production and allows me to spend more time focusing on pose and expression." Another customer reached out to thank the Frame A Face development team for saving him time and money: "This is the batch cropping program I've been looking for." The technological revolution in the photographic industry may have started when the price of a professional DSLR dipped below $2000, but with this new wave of highly intelligent software, the creators behind Frame a Face have ensured that the future of digital imaging will look very different from the software offering of today.